Aman showed no emotion yesterday after a Supreme Court jury convicted him of the murder of his father. 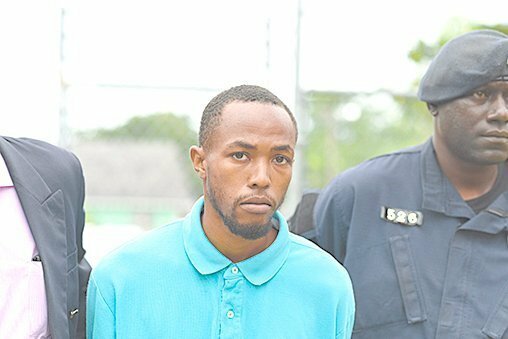 Justice Bernard Turner will commence the penalty phase of Lee Sweeting’s trial on June 13. It took jurors two hours to unanimously decide that the 23-year-old murdered his father, Leon Sweeting, between Thursday, November 23 and Friday, November 24, 2017 after his father refused to give him money. The elderly man was found dead in his home at Ambergris Street off Faith Avenue on November 24. After the murder, the accused went home and dressed a wound to his hand, before going to the hospital to get treatment for a cut on his hand. Sweeting initially told police and relatives he cut his hand when he fell on glass while running from a pack of dogs. However, in a later interview, the unemployed Sweeting told investigators that he had asked his 76-year-old father for money and his dad chastised him for being “a waste of a life”. In the interview, he claimed that his father attacked him with the knife and he acted in self-defense. The accused sustained a single cut to his hand and his father was stabbed 47 times. At trial, Sweeting relied on his interview to police and exercised his right to remain silent. Turner warned the jury that Sweeting’s silence should not be considered a sign of guilt as it was the prosecution who had to prove its case. Pathologist Dr. Caryn Sands said that the deceased had defensive injuries to his hands. Cordell Frazier and Camille Gomez prosecuted. Shaka Serville appeared for Sweeting.